Welcome to the ninth in our series of weekly puzzles. Ages ago, before the start of this series, Tilsit promised to write a puzzle for the blog. Well, at long last here it is! There is a theme and you must read the preamble before starting – if you don’t you may finish up scratching your head for quite a while. This started out life as a puzzle on the old Enigmatist website a few years ago, but I have redesigned and rewritten most of the clues so that most visitors to this site can try something a little different, but should still be within your solving capabilities. Thanks to Big Dave for road-testing it and making a few helpful suggestions. I am happy to receive all feedback and hope that you won’t be too put off by the preamble! As the puzzle unwinds, it should make sense. Hopefully, this will be the first of many for the site. It’s nice to have been bitten by the compiling bug once again. 20a, 4d, 7d, 19d, 21d, 23d and 24d are all 14 down; as, it could be argued are 17a, 1d, 3d and 5d. Most have no definition. 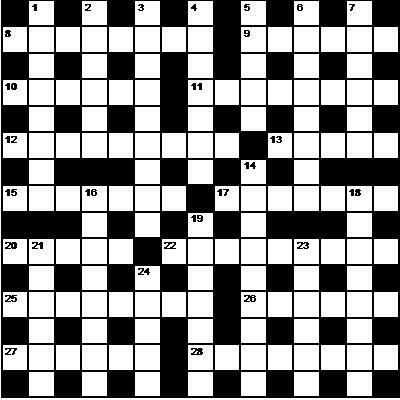 Each clue (except 14 down) contains an extra word, the initial letters of which spell out three names associated with the theme.